Thursday January 28th 1926 I wrote to Winnie and Grace Taylor before lunch. Went down town to the Dr and to the office to come home with Ott. Letter from Hattie. Friday January 29th 1926 I was sewing in AM for Ott. Wrote Hattie and a note to Edith in PM. A light steady rain part of the day. We went after Ott. Home for supper. 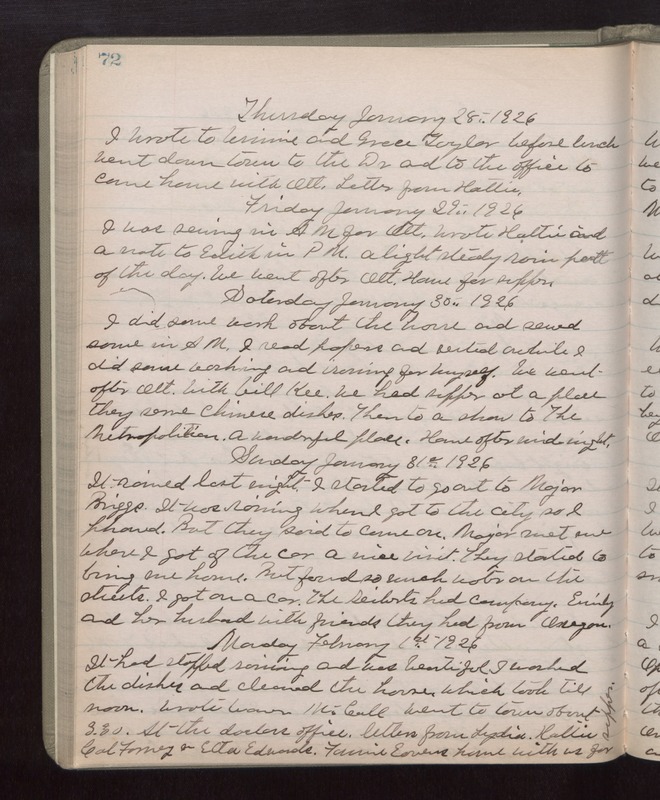 Saturday January 30th 1926 I did some work about the house and sewed some in AM. I read papers and rested awhile. I did some washing and ironing for myself. We went after Ott with Will Kee. We had supper at a place they serve Chinese dishes. Then to a show to The Metropolitan. A wonderful place. Home after midnight. Sunday January 31st 1926 It rained last night. I started to go out to Major Briggs. It was raining when I got to the city so I phones but they said come on. Major met me where I got of the car. A nice visit. They started to bring me home but found so much water on the streets. I got on a car. The Seiberts had company. Emily and her husband with friend. They had from Oregon. Monday February 1st 1926 It had stopped raining and was beautiful. I washed the dishes and cleaned the house which took till noon. Wrote Warner McCall. went to town about 3.30. At the doctors office. Letters from Lydia, Hattie, Cal Forney & Etta Edwards. Fannie Eavens home with us for supper.